The Metropolitan Museum of Art, Gift of Alexander Smith Cochran, 1913. A rare look at the Golden Age of the arts in Iran. The first two shahs of the Safavid dynasty, the charismatic Isma’il and his son Tahmasp, promoted a cultural flowering of extraordinary brilliance. Bringing together for the first time exquisite carpets and textiles, ceramics, stunning metalwork and illuminated manuscripts and bindings, the exhibition explores the complex interaction of royal patronage and religious faith that inspired this remarkable period of artistic creativity. In the late 13th century, Shaykh Safi al-Din Ishaq founded a Sufi order at Ardabil in Azarbaijan, where he attracted followers among the nomads of Eastern Anatolia and Azarbaijan. From the 14th to the mid-15th century, the Ardabil Shrine continued to attract Sufis and increase in wealth and fame. The shaykhs of Ardabil were Sunni Muslims until the mid-15th century, when they espoused Shi‘ism. By that time, the Shaykh Safi’s successors had become increasingly militant and their armies had come to wield significant power in the region. The Safavid family intermarried with the Aq Qoyunlu Turkmen dynasty of Tabriz, which controlled most of western Iran during the last quarter of the 15th century. Eastern Iran and nearby sections of Central Asia were ruled by the rival Timurid dynasty. In 1488, the Shaykh Haydar, the leader of the Safavid order, was killed in a battle with the Aq Qoyunlu forces, leaving seven sons. In an effort to destroy the power of the Safavid order the Aq Qoyunlus seized Haydar’s eldest son Ali Mirza, and two of the latter’s brothers, Ibrahim and Isma‘il, and imprisoned them far from their supporters near the city of Shiraz. 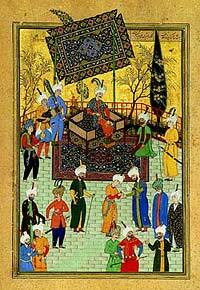 In 1493, during a struggle between rival Aq Qoyunlu princes, Haydar’s sons were released and allowed to rejoin their Sufi followers. After his release Ali was recognized as the leader of the Safavid order but was soon killed by the Aq Qoyunlusr, and Isma‘il was designated his successor as leader of the Safavid order. For the next four and a half years, Isma‘il received instruction in the Qur’an and in the Persian and Arabic languages. In 1499, at the age of twelve, Isma‘il made his bid for power by moving into Anatolia. By 1501, he had secured Azarbaijan and crowned himself shah at Tabriz. In 1503, he added Shiraz to his domains, followed by Baghdad in 1507 and Herat in 1508. Persia, the region that we know as Iran, was united politically and geographically under the banner of Shi‘ism. In 1514, Isma‘il’s armies were defeated by the Ottomans, who occupied Tabriz for only one week. The Safavids returned to their capital, but the Ottoman threat continued into the next reign. Upon Isma‘il’s death in 1524, he was succeeded by his first son, Tahmasp. Born in 1514, Tahmasp was sent to serve as governor of Herat in 1516. 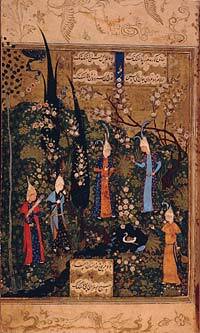 Tahmasp’s education continued at Tabriz after his nominal accession to Safavid throne. In 1533 he took full control of the government from his guardians and continued to exercise power until his death in 1576. During the course of Tahmasp’s fifty-one year reign, the Safavids, sandwiched between the Ottomans to the West and the Uzbeks and Mughals in the East, were constantly challenged to keep their domain intact. Despite the fact that his life was largely shaped by wars and insurrections that kept him moving from one region to another, Tahmasp became a great patron of the arts. An atelier of court artists and poets accompanied him on his campaigns. 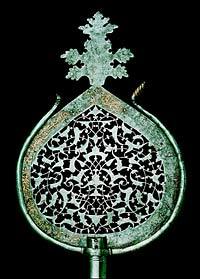 Tahmasp’s immediate successors were less important both as rulers and as patrons of the arts but there was a revival under Shah Abbas (1587–1629) when the state had increased power and the arts, commerce and religion flourished. 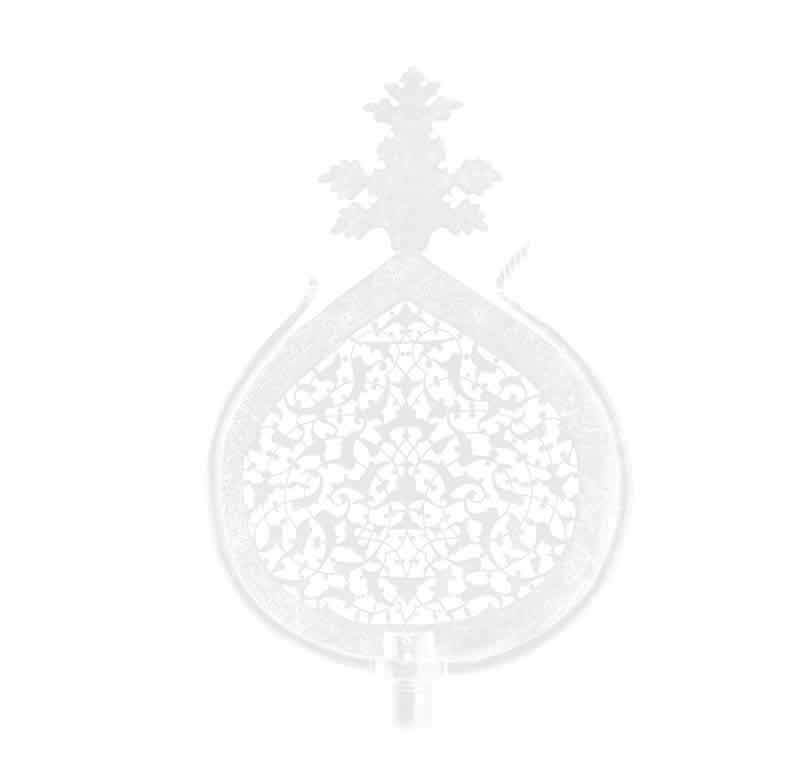 After his death, the empire gradually declined although the Safavid dynasty survived into the18th century. Major support for this exhibition and related programs is provided by The Starr Foundation, Doris Duke Foundation for Islamic Art and The Folger Fund. Click here to read this story from the Shahnameh (Book of Kings), illustrated with works of art from the exhibition. Access AsiaFood's online feature presenting recipes, ceremonies, and ancient tales from this rich collection of Persian and modern Iranian culinary traditions.